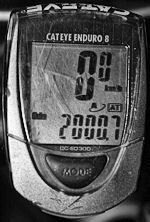 In the end, we just managed 2,000km for 2008 after a desperate quickie along the Keelung River yesterday to break through the 2000 mark. 2,000.7km to be exact. But that's all that's needed, and with the slow autumn, it's an OK distance. Last year, we did around 1,100km. Apart from all the standard day trips around Taipei, we did three longer rides around the island. In March, we went from Taidong to Hualian, crossing over the coastal mountain range to and from the East Rift Valley three times, a great ride of 250-odd kilometers over two days. Then in May, we finally did the Northern Cross Island Highway, which was a good ride, but the first day was lost to rain. But I think our favorite was the August ride across the Hengchun Peninsula from Damali (大麻里) via Dawu (大武), Shouka (壽卡) and Checheng (車城) down to Kenting and a dip in the Taiwan Strait. The only fixed plan for 2009 seems to be the Central Cross Island Highway, but there will be other rides outside of Taipei, too, and we'll also try find other day rides in the Taipei area. I have been out for a couple 50km rides – yesterday took the bike to the shop – had a dead link of chain, which was causing me trouble on the hills – The shop owner fixed on the spot! Let’s go for another ride soon. We should. We’re having a slow start to the year, haven’t been on the bike yet due to a bad shoulder, and this weekend I’ll have to stay home working. But after that we’ll hopefully be back at it again. The goal is to beat 2000 this year.